No, this post is not about getting drunk. 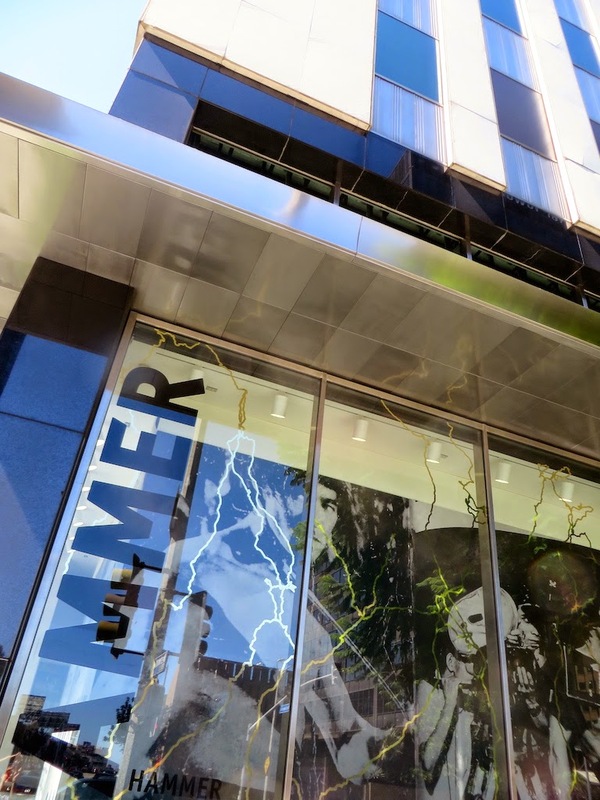 Rather, it's about art and the Hammer Museum in Westwood, Los Angeles, although perhaps a drink or two might have helped me to understand some of the rather esoteric artwork on display! 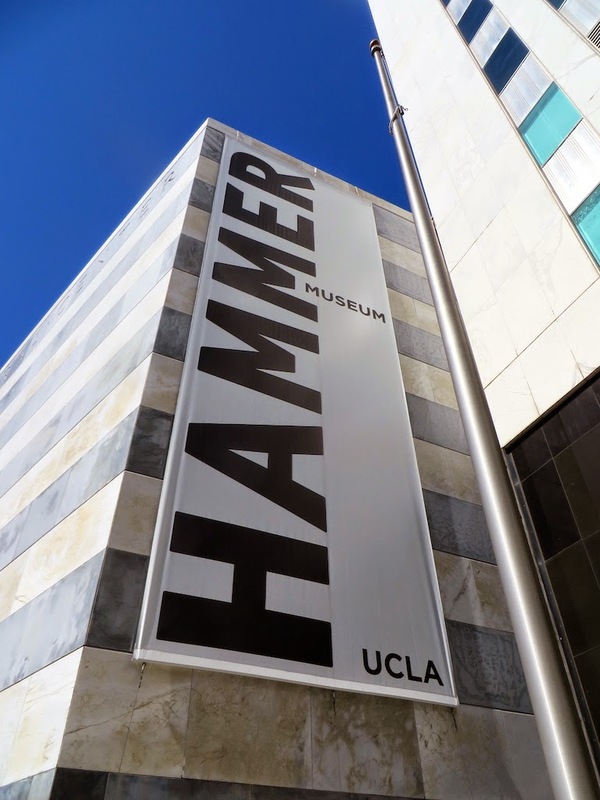 The Hammer Museum was founded by Dr. Armand Hammer who was a former chairman of Occidental Petroleum Corporation. He died before he could see his vision completed in 1990. Two years later, the operations of the museum were taken over by UCLA. The exhibit we saw at the museum featured art from emerging L.A. artists entitled "L.A. Now". The outfit I am wearing features a new skirt from H&M which sort of makes me feel like a flamenco dancer. Also, how is it that whenever I go to a museum, the sticker that they give you always matches my outfit? 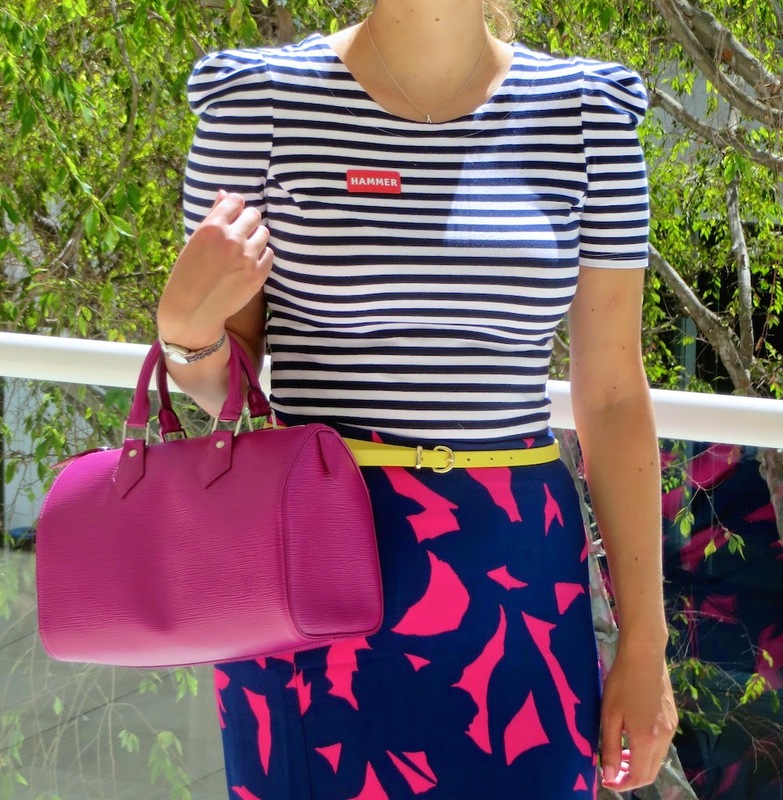 The pink of the sticker is the perfect complement to the pink in my skirt! So the next part of this post is something that I am just going to call "Art or Not Art?" A few years back when my husband and I went to the Museum of Contemporary Art San Diego in La Jolla, we came across a portable phone mounted on the wall in the museum. My husband insisted it was art (and he hates contemporary art) while I scoffed, assuming he was being flip. My response was "of course it's not art, it's just a phone!". Well, much to my surprise, it turned out to be part of the exhibit. Go figure! So take a look at the photos below. 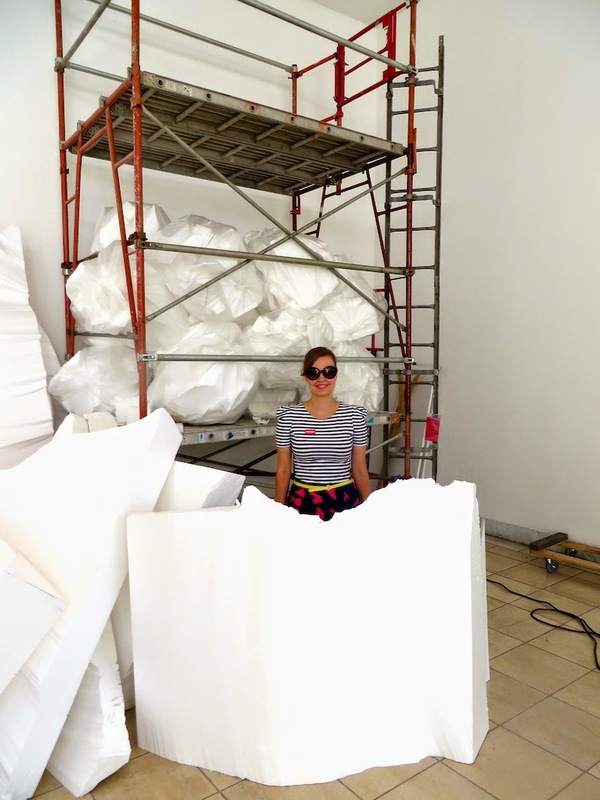 Do you think I am standing in an art installation bellow or just a pile of crap, I mean Styrofoam? Art or not art? What say you? If you guessed not art, you would be correct. I honestly thought this was part of the exhibit as it had a little sign telling you that you had to consent to having your likeness video recorded if you entered. Well, it was not really anything, or maybe it was the beginning of something not fully formed? Whatever it was, the security guard told us we couldn't take pictures here, so shhhh... don't tell anyone. I hope you enjoyed my trip to the Hammer in Westwood. If you would like to see some interesting art and installations, or ponder the mysteries of "what is art?" this is the place to go! Hah - that looks like fun! 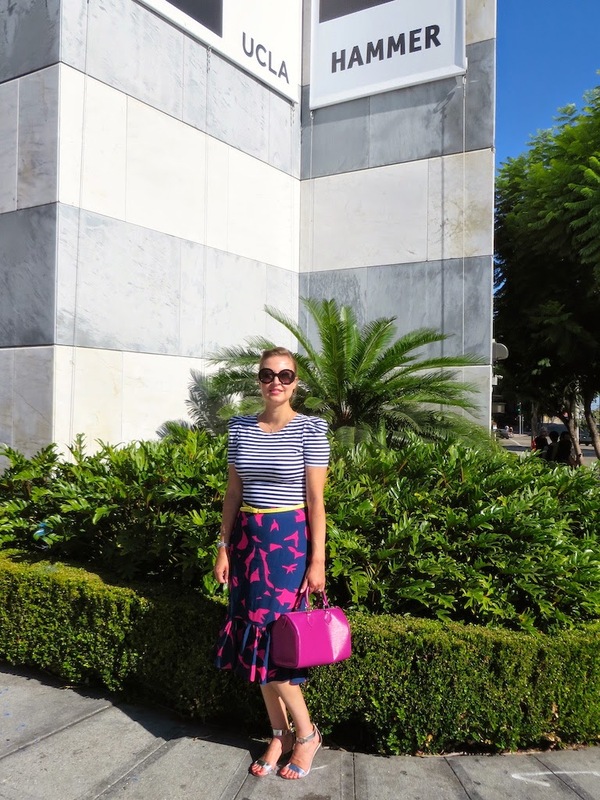 The print on your skirt looks great on you! Thanks Laura! I didn't even think of the connection with the song! Love that skirt!! And I love that you paired it with a neon yellow belt!! Perfection! Thanks Lena! I am a big fan of lots of color as you can probably tell. Thanks for hosting the linkup and stopping by! Gorgeous outfit. 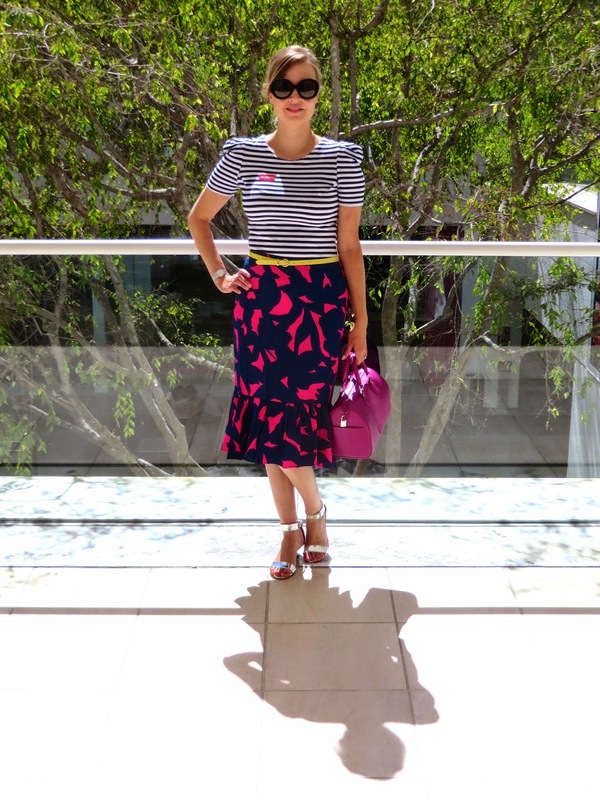 That skirt is so pretty Katie and I love it paired with the Breton Tee. Looking great. Enjoy the weekend, Pretty Lady!! Thanks Ada! I hope you have a great weekend too! Haha! Sorry that this post didn't contain any actual alcohol! Thanks for stopping by Linda! Great metallic sandals and fun interpretation of photos. Thanks Renae! I get a ton of use out of these sandals. They are probably my favorite summer shoe. Thanks for hosting the linkup and stopping by!